A little wax and soap can help build electrodes for cheaper lithium ion batteries, according to a study in August 11 issue of Nano Letters. The one-step method will allow battery developers to explore lower-priced alternatives to the lithium ion-metal oxide batteries currently on the market. "Paraffin provides a medium in which to grow good electrode materials," said materials scientist Daiwon Choi of Pacific Northwest National Laboratory's Transformational Materials Science Initiative. "This method will help researchers investigate cathode materials based on cheaper transition metals such as manganese or iron." Consumers use long-lasting rechargeable lithium ion batteries in everything from cell phones to the latest portable gadget. Some carmakers want to use them in vehicles. Most lithium ion batteries available today are designed with an oxide of metal such as cobalt, nickel, or manganese. Choi and colleagues at PNNL and State University of New York at Binghamton wanted to explore both cheaper metals and the more stable phosphate in place of oxide. The Recharge Tale. These rechargeable batteries work because lithium is selfish and wants its own electron. Positively charged lithium ions normally hang out in metal oxide, the stable, positive electrode in batteries. Metal oxide generously shares its electrons with the lithium ions. 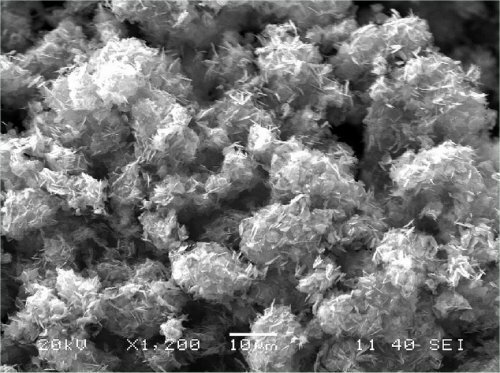 Made with a one-step method, these flakes of lithium manganese phosphate can serve as electrodes for batteries. Charging with electricity pumps electrons into the negative electrode, and when the lithium ions see the free-floating negative charges across the battery, they become attracted to life away from the metal oxide cage. So off the lithium ions go, abandoning the metal oxide and its shared electrons to spend time enjoying their own private ones. But the affair doesn't last—using the battery in an electronic device creates a conduit through which the slippery electrons can flow. Losing their electrons, the lithium ions slink back to the ever-waiting metal oxide. Recharging starts the whole sordid process over. Cheaper, Stabler. While cobalt oxide performs well in lithium batteries, cobalt and nickel are more expensive than manganese or iron. In addition, substituting phosphate for oxide provides a more stable structure for lithium. Lithium iron phosphate batteries are commercially available in some power tools and solar products, but synthesis of the electrode material is complicated. Choi and colleagues wanted to develop a simple method to turn lithium metal phosphate into a good electrode. Lithium manganese phosphate—LMP—can theoretically store some of the highest amounts of energy of the rechargeable batteries, weighing in at 171 milliAmp hours per gram of material. High storage capacity allows the batteries to be light. But other investigators working with LMP have not even been able to eek out 120 milliAmp hours per gram so far from the material they've synthesized. Choi reasoned the 30 percent loss in capacity could be due to lithium and electrons having to battle their way through the metal oxide, a property called resistance. The less distance lithium and electrons have to travel out of the cathode, he thought, the less resistance and the more electricity could be stored. A smaller particle would decrease that distance. But growing smaller particles requires lower temperatures. Unfortunately, lower temperatures means the metal oxide molecules fail to line up well in the crystals. Randomness is unsuitable for cathode materials, so the researchers needed a framework in which the ingredients—lithium, manganese and phosphate—could arrange themselves into neat crystals. Wax On, Wax Off. Paraffin wax is made up of long straight molecules that don't react with much, and the long molecules might help line things up. Soap—a surfactant called oleic acid—might help the growing crystals disperse evenly. So, Choi and colleagues mixed the electrode ingredients with melted paraffin and oleic acid and let the crystals grow as they slowly raised the temperature. By 400 Celsius (four times the temperature of boiling water), crystals had formed and the wax and soap had boiled off. Materials scientists generally strengthen metals by subjecting them to high heat, so the team raised the temperature even more to meld the crystals into a plate. "This method is a lot simpler than other ways of making lithium manganese phosphate cathodes," said Choi. "Other groups have a complicated, multi-step process. We mix all the components and heat it up." To measure the size of the miniscule plates, the team used a transmission electron microscope in EMSL, DOE's Environmental Molecular Sciences Laboratory on the PNNL campus. Up close, tiny, thin rectangles poked every which way. The nanoplates measured about 50 nanometers thick—about a thousand times thinner than a human hair—and up to 2000 nanometers on a side. Other analyses showed the crystal growth was suitable for electrodes. To test LMP, the team shook the nanoplates free from one another and added a conductive carbon backing, which serves as the positive electrode. The team tested how much electricity the material could store after charging and discharging fast or slowly. When the researchers charged the nanoplates slowly over a day and then discharged them just as slowly, the LMP mini battery held a little more than 150 milliAmp hours per gram of material, higher than other researchers had been able to attain. But when the battery was discharged fast—say, within an hour, that dropped to about 117, comparable to other material. Its best performance knocked at the theoretical maximum at 168 milliAmp hours per gram, when it was slowly charged and discharged over two days. Charging and discharging in an hour—a reasonable goal for use in consumer electronics—allowed it to store a measly 54 milliAmp hours per gram. Although this version of an LMP battery charges slower than other cathode materials, Choi said the real advantage to this work is that the easy, one-step method will let them explore a wide variety of cheap materials that have traditionally been difficult to work with in developing lithium ion rechargeable batteries. In the future, the team will change how they incorporate the carbon coating on the LMP nanoplates, which might improve their charge and discharge rates. Acknowledgments: This work was supported by PNNL and DOE's Offices of Energy Efficiency and Renewable Energy and of Electricity Delivery and Energy Reliability. This work was done by Daiwon Choi, Donghai Wang, In-Tae Bae, Jie Xiao, Zimin Nie, Wei Wang, Vilayanur V. Viswanathan, Yun Jung Lee, Ji-Guang Zhang, Gordon L. Graff, Zhenguo Yang, and Jun Liu of PNNL and In-Tae Bae of State University of New York in Binghamton. Key research was done in DOE's EMSL, a national scientific user facility. Reference: Choi D, D Wang, IT Bae, J Xiao, Z Nie, W Wang, VV Viswanathan, YJ Lee, JG Zhang, GL Graff, Z Yang, and J Liu. 2010." LiMnPO4 Nanoplate Grown via Solid-State Reaction in Molten Hydrocarbon for Li-ion Battery Cathode," Nano Letters. DOI 10.1021/nl1007085.